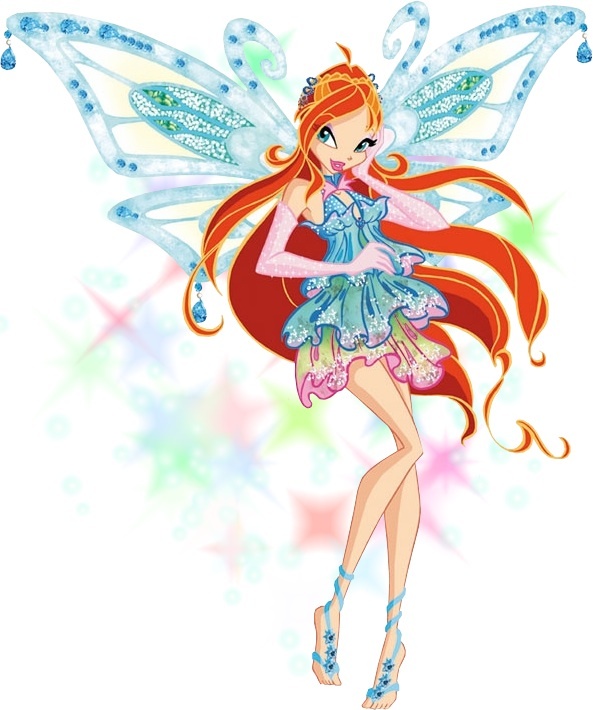 Winx Topix: Why is Bloom a Mary Sue? Bloom is far too divine to just be called “Bloom”, let’s call her Bloom Almighty. Is Bloom a Mary Sue? Question is: why is Bloom a Mary Sue? Fist, let’s look at the definition of a Mary Sue. “The prototypical Mary Sue is an original female character in a fanfic who obviously serves as an idealized version of the author mainly for the purpose of Wish Fulfillment. She’s exotically beautiful, often having an unusual hair or eye color, and has a similarly cool and exotic name. She’s exceptionally talented in an implausibly wide variety of areas, and may possess skills that are rare or nonexistent in the canon setting. She also lacks any realistic, or at least story-relevant, character flaws — either that or her “flaws” are obviously meant to be endearing. In other words, Mary Sues are characters who are portrayed as being so perfect without flaw that it becomes a flaw unto itself. This has Bloom written all over it. Bloom is beautiful, let’s face it. Her character design always has a lot more effort put into it than the other girls’ combined. Red is a pretty unusual hair colour, or it may be unusual, I’m not quite sure. As for ‘cool, exotic names’, ‘Bloom’ must be pretty cool for them to name a whole transformation after it. Bloom is the princess and last survivor of a continent that spent nearly 17 years under ice, as well as being the wielder of the Dragon Flame, the source of magic. Her backstory is so important that it over shadows that of the other girls. We have yet to see Flora and Tecna’s parents, yet we’ve all memorised and heard Bloom’s backstory so many times it hurts. Maybe the rest of the Winx aren’t that, but the side characters, particularly those in Domino, are quick to applaud Bloom on how smart and powerful she is. This is painfully apparent in Winx S6E6. This is an unfortunate case with Diaspro. I quite like Diaspro, as I felt she had every right to hate Bloom after she was cheated on by Sky with Bloom. However, she was portrayed in such a negative light, causing several people to hate Diaspro, who had done nothing wrong and feel for Bloom, who had attacked her without reason. In S5, Diaspro came a long way to help Sky regain his memories. Yet Bloom still went ahead and cried crocodile tears at the plain sight of her. Winx S6E6 says it all. I don’t think Musa or Tecna had any lines in that episode. So, these are the reasons why Bloom is a Mary Sue. The audience are constantly reminded of how great Bloom is and that ends up leaving the opposite impression on a person’s mind. If a belief or thought is constantly forcefully hammered into a person’s head, that person will rebel against that belief or thought and, over time, will eventually grow to despise it. In this case, it is the belief that Bloom is all powerful and all mighty.